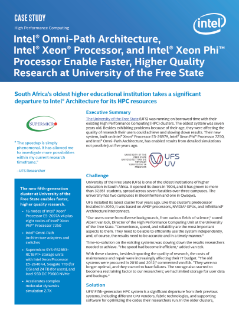 The University of the Free State (UFS) was running on borrowed time with their existing High Performance Computing (HPC) clusters. The oldest system was seven years old. Besides exhibiting problems because of their age, they were aﬀecting the quality of research their users could achieve and slowing down results. Their new system, built on Intel® Xeon® Processor E5-2697A, Intel® Xeon Phi™ ...Processor 7250, and Intel® Omni-Path Architecture, has enabled results from detailed simulations not possible just 5 years ago.